This week’s exercise: describe how players might join or start a game of Go Fish versus single-player Quake. Chapter 2 starts describing each of these games, which seem incredibly different, yet Fullerton points out that we all agree that these are both considered games and not two different types of entertainment. So what do they have in common? What makes them both games? Ok, but how does a player start a game of Go Fish? It requires three to six players to agree to play at a specific time and place together. That place should also be available. You can’t play if you decided to meet at a park bench, only to arrive and discover that it is occupied by a family having a picnic. Someone needs to bring a standard deck of playing cards, and someone has to be chosen as the dealer to deal out cards and determine who starts the game. Depending on schedule conflicts, space availability, and how much any participant is willing to let someone be a dealer, it can be more or less difficult to arrange a game. Trying to play with two young children who are insistent that each should go first could derail the entire experience. And Quake? Well, I’ll be honest. I’ve never played the original Quake. I’ve played Quake 3, however, and while it is best played in a multiplayer environment, it is possible to play it by yourself against the computer-controlled opponents. There are other requirements, such as needing your electric bill paid so you can power the computer in the first place. Or perhaps you are playing in an Internet cafe or at your college campus computer lab, which each require some level of payment at some point for you to gain access. But in both cases, you needed to decide on a time to play the game. Playing the game requires a dedication of time beyond the start time. Whether you play for 30 minutes or three hours, it takes time that you aren’t spending on some other task. Both games require your presence to play. Even if you are waiting your turn in Go Fish, you are an active participant, especially when someone asks you about your cards. In Quake 3, the game happens in real-time and requires your attention at all times. Both required more than just the players. 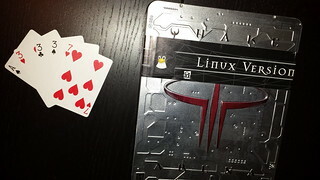 A deck of cards is much less expensive than an entire computer and the cost of a copy of Quake 3, but the point is that in each case you need materials to play. This exercise was relatively short, but it still drives the point home: there is something about games, and specifically the nature of the need for games to have players participating, that makes them games. If you participated in exercise 2.2 on your own, please comment below to let me know, and if you wrote your own blog post or discuss it online, make sure to use the hashtag #GDWW. Next week, we’ll look at objectives in games.